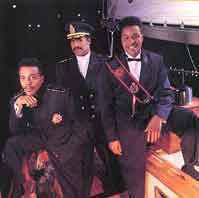 Three piece soul vocal group formed in the mid-80's by songwriter David Townsend (son of singer/songwriter Ed Townsend), multi-instrumentalist David “Pic” Conley and singer/songwriter/lead vocalist Bernard Jackson. Originally staff writers for EMI providing songs for Gwen Guthrie and Sister Sledge, they charted in 1987 with “Happy,” from their debut album "Surface". Further hits and a second album "2nd Wave" followed in 1990. 1991 saw the release of "3 Deep" and a greatest hits complilation "A Nice Time for Lovin'" in 1992. Townsend and Conley concentrated on songwriting after this but the group returned with "Love Zone" (1998). They announced a reunion tour for Summer 2005 and the recording of a new album. Sadly, David Townsend died on October 29, 2005 at age 50 before the album was completed.